Winnipeg native Mark Stone scored twice and Matt Duchene added a goal and an assist to lead the Ottawa Senators to a 5-2 win over the visiting Jets on Saturday afternoon. The Ottawa Senators received a bit of a morale boost by beating one of the best teams in the league. Winnipeg native Mark Stone scored twice to lead the Senators to a 5-2 victory over the Jets on Saturday afternoon. "That's a good team," said Stone. "They obviously pressed pretty hard in the third period and (Nilsson) had to make some big saves, but you expect that from a team like that. Overall, I thought we did a really good job of containing them." For the second straight game the Senators got an impressive performance from back-up Anders Nilsson, who made 44 saves. "Nilsson, let's be honest, he held us in the game there for a few stretches," said Zack Smith, who scored his first goal since Dec. 11. 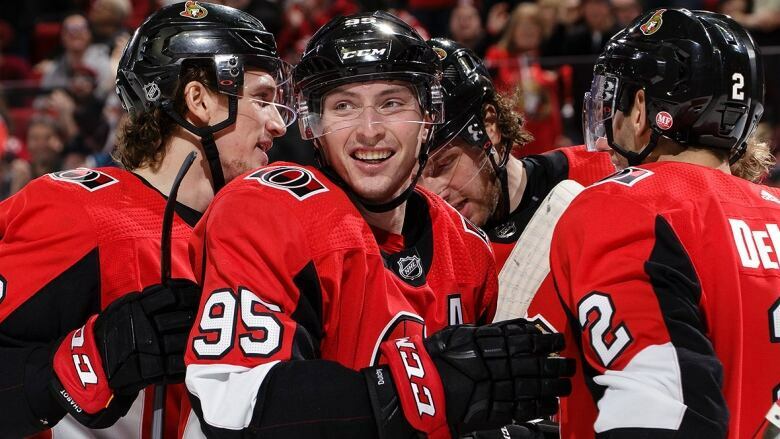 Matt Duchene and Ryan Dzingel also scored for the Senators (21-29-5). "Obviously, I was fighting the puck a little bit (Saturday)," said Brossoit. "I didn't feel at my best. I thought the team played pretty well, a lot of end zone time and Nilsson played really well." Brossoit wouldn't make any excuses for his play. "To be honest, I didn't like many of the goals I let in (Saturday). They weren't necessarily great shots," he said. "I don't think I really forced them to beat me. Like I said I was fighting it a bit and there's a few I wanted back. It's a tough feeling to put a lot of pressure to score six to win the game. It's a game I'm going to put behind me and move forward." Maurice understood Brossoit's disappointment, but said he was far from the only reason they lost. "Laurent's been so good for us all year, and I have a real difficult time critiquing, but that wasn't his best game, we know that," said Maurice. "I don't feel comfortable saying we lost the game because of him." The Jets looked to get back in the game, but couldn't take advantage of an early power play in the third. The Senators have not allowed a power-play goal in their last 12 games. Winnipeg dominated the play, hemming the Senators in at one point for nearly two minutes, but still couldn't capitalize. "In that third period I think I had the longest shift of my career where you saw three different lines in one shift," said Smith. "They had us hemmed in. They had a lot of puck possession, but I think we did a pretty good keeping them to the outside." The Senators put the game out of reach as Smith made it 5-1 with under five minutes remaining. Morrissey scored in the final minute of play for the Jets, but Winnipeg's comeback stopped there. "Winnipeg's a really good team and a heavy team to play against," said Nilsson, who has allowed just two goals on 91 shots through two games. "They pushed us back in the third a little bit, but I like the way we managed it and how we played in our zone. "It felt like we didn't panic and we protected the middle really good and the shots they had were mostly from the outside and that makes it a lot easier for me." Trailing 2-0, the Jets scored two minutes into the second period as a couple defensive miscues allowed Patrik Laine to find Little, who beat Nilsson with a one-timer. But the Senators regained the two-goal lead on a power play midway through the period as Stone, with his second of the game, beat Brossoit high glove side. The Senators made it 4-1 three minutes later. Brossoit appeared to have the puck, but it trickled through his pads and Duchene buried it for his 25th of the season. The Senators got off to a great start, taking a 2-0 first-period lead. Chris Tierney found Stone, who quickly fired off a wrist shot past Brossoit early in the period and Dzingel made it 2-0 at the 12-minute mark going post and in.